In a word: Incommensurable Mexican. CJ ate the jicama and cucumber salad. JM ate the mango salmon. Jordan ate the carne asada with an horchata. Nichole ate the enchiladas de pollo de mole with an horchata. 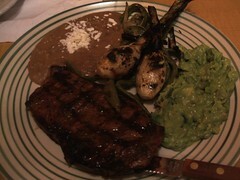 Tanya ate the grilled vegetables and side of black beans with an horchata. We split the quesadilla appetizer, verduas en vinagre, and a side of guacamole. The bill was $80, or $16/person, plus tip. JM gave La Mestiza an A-; Jordan and Tanya gave La Mestiza a B+; Nichole gave La Mestiza a B- (see our grading rubric). One reason that we try to go out with other people so frequently is that after so many Mexican restaurants we would probably go nuts and give 'em all Fs or something. We went to La Mestiza in the middle of one of this winter's numerous bad cold snaps, and so were grateful for the curtain over the door (Icon could take a page from them in the comfort department). Also warm and welcoming was our server, who had good recommendations and brought out something to nosh right away. The chips and two kinds of tomatillo salsa were first-rate. Jordan theorized this was because they seemed to be more intensely fried than usual. The green salsa was very mild, with a bit of avocado and cilantro. The red salsa was hotter, with a smoky flavor. 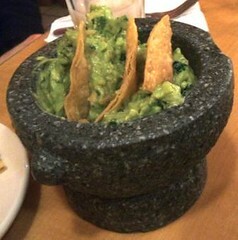 We were glad we also got the guacamole, which came in a heavy stone molcajete and was fresh-tasting and bright green. Both were superior to most pre-meal salsa starters. The quesadilla appetizer gave us each a couple bites of delicious, cheesy poblano-peppered goodness. 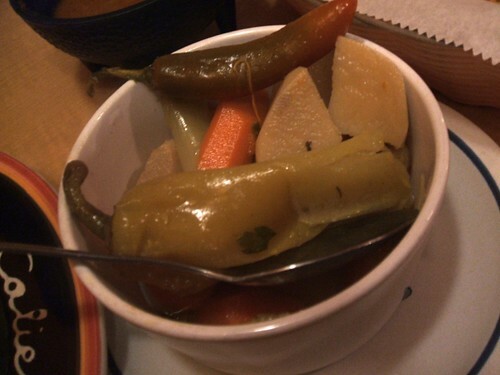 Jerry says the verduas en vinagre (vegetables in a pickling vinegar and spice mix) were quite mild. Don't believe a word of it - they were delightfully hot this time. So far this is the only way Nichole has found to enjoy jicama, which can be terribly woody. Plus, "pickled jicama" is fun to say. Jordan found the menu a "nice break from the usual Tex-Mex (or worse, Wisc-Mex) burrito, burrito, enchilada, chimichanga." Tonight he was sad to hear that the renowned lamb shoulder in pasilla sauce wouldn't be ready for a couple hours, so he went with the carne asada. It was pretty straightforward but good. He was excited about the nopales, but later remembered that roasted nopales basically taste like a less-flavorful green pepper. More interesting were the cebollitas, which made us long for summer grill-outs. Tanya had few vegetarian choices. Her grilled vegetables were simple but yummy, especially where they were really charred. A side of black beans added some heft, if not excitement, to the meal. JM's salmon with mango sauce was tasty but a little dry. The rice was subpar, but OK. (He wasn't a big fan of the green peas mixed into it.) The presentation, though, was a festival of color; and fish, as we have seen from El Pescador, turns out to be a fantastic vehicle for sals-y flavor. A little of the premeal salsa added to the overall experience as well. Nichole went with the enchiladas de pollo de mole, her favorite comfort food. The tender shredded chicken was wrapped in soft tortillas and covered in a rather flat, slightly gritty mole that mostly tasted like chili powder. On the other hand, it was a welcome change from overly-tomato flavored mole sauces. And though the very friendly and helpful server offered to sub refried beans for the rice, no dice. Not that we didn't have plenty to eat - our table, one of the largest ones available, was crowded with plates and dishes. We were all tickled when at the end of the meal our server asked if we were in the restaurant business - something about the amount of stuff we ordered begged the question (or maybe it was the furtive picture-snapping, sadly lost to gadget limbo*). The staff at Pegasus, the friendly local game store next door, also recommend the tortilla soup and flautas as authentic and delicious. 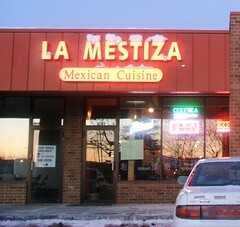 On the other hand, we hear La Mestiza's radio ads on La Movida mispronounce common Spanish words. Without getting into the great authenticity debate, we can be confident at least saying La Mestiza serves up creative Oaxacan-inflected eats in a slightly more Anglified setting than the average Madison Mexican sit-down place, though the price also reflects that. *Update 4/26/08: Our camera just mysteriously coughed up the La Mestiza pictures. Enjoy! Yes, what is up with the La Mestiza ad? The guy definitely is pretending to have a Spanish accent, it's totally fake, and sounds really bad. The very last few words remind me of The Continental, the character Christopher Walken played on Saturday Night Live. Why do that? It's embarrassing. Best Mexican food in Madison --by FAR. The pollo de mole is sooo good -as it their carne asada taqueria-style tacos. The commercial guy is the same one that does most of the commercials for Clear Channel in Madison. I find it annoying and almost insulting that radio people think the advert for an "ethnic" place won't work if it's not spoken as if someone from that ethnicity were speaking. And yeah. "OCKS-uh-kuh", "chee-POHL-tuh-lay" and "PAH-BLAH-no" are not authentic pronunciations. Yuck. Don't care how they say the food words on the wireless y'all. Ate here for brunch and lunch a few times during the last few weeks, and I have to say preety darn good. The red sauce is the best I've had in Madison, and the prices are not out of line for what you get. My boyfriend and I ate here today. I was pleasantly surprised. First, it doesn't have the standard Mexican restaurant menu. I would say the standard Madison Mexican restaurant menu, but I have seen that same standard menu in other states, too. I got the vegetable enchiladas. It was in a nicely flavored, but not hot, sauce. It was described as a pumpkin seed sauce. It wasn't nearly as good as the pumpkin seed mole at Riviera Maya in Milwaukee, but it was still good. I also enjoyed their hot salsa. While salsa was hot, it still had other flavors. My boyfriend and I split a flourless chocolate cake. It was rich and tasty. I have heard some restaurant critics bash flourless chocolate cakes because they are so passe. I don't care if it is passe; it is yummy. I went there last night for dinner. I agree with comments mentioned above that it was refreshing that the menu wasn't the typical tacos and burritos fare. The chips were well-fried flour tortillas (had to find and my preference), the salsas as described above. My dinner companion and I had the lamb chop special - 3 simply-prepared, grilled chops, served medium, with refried beans, grilled baby onions and nopales, and guacamole. The margaritas are yummy. I'll go back in a heartbeat! Having been to Mexico 5 times, I have yet to taste enchiladas and quesadillas this good. The seasoning of the meat and sauces are AMAZING.